An ink-stained entrepreneur revamps beer labels and CD cases. 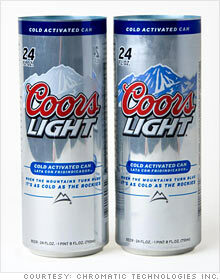 CTI's ink turns the mountains blue on cold cans of Coors. On Chickenfoot's debut CD, song titles and images appear when the cover is exposed to heat or light. What's most important to you when choosing where to live? Think you have what it takes to start a business during a recession? These 8 entrepreneurs are giving it a shot, with mixed results. (Fortune Small Business) -- As an undergraduate at Cornell University, Lyle Small annoyed his housemates by spending days on end painting their Ping-Pong table in rainbow shades of ink. He brewed chemicals to create inks that changed hue when exposed to light and heat. "I got obsessed," says Small, now 41. "I thought all printing inks should change color." Two decades later his passion is paying dividends. Small's Colorado Springs company, Chromatic Technologies Inc. (CTI), is booming while rivals in the ink industry are cutting back. Music distributors, foodmakers and the beer giant MillerCoors are using Small's color-changing ink to make their packaging stand out. CTI landed 120 new customers in 2008. Small expects sales to double this year, to $10 million. Thanks to CTI's ink, the mountains on Coors Light cans turn blue when the beer reaches optimal drinking temperature (roughly 43�-50�F). Coors (TAP, Fortune 500) already used color-changing ink on paper labels for bottles, but the brewer had struggled to find a contractor that could create the same effect on cans. "CTI is the only one that delivered," says Ray Toms, a MillerCoors scientist who worked on the project. MillerCoors signed a two-year contract to buy all of its ink for cans from CTI. The beer company will account for 40% of Small's revenue this year. The deal took persistence. When CTI first approached Coors in 2001, Small couldn't guarantee that the ink would work in high-volume production. Coors printed 20 million cans of Coors Light every day; any downtime would be costly. So Small arranged painstaking tests in canning factories in eight countries. Three years later he was ready to ink a deal. The brewer's faith has paid off. Amid flat beer industry sales, Coors Light saw 3% growth this year. The color-changing artwork is prominently featured in the company's TV ads. "It's resonating with consumers," says Benj Steinman, publisher of Beer Marketer's Insight. In May, CTI announced another high-profile deal, this time in the music industry. 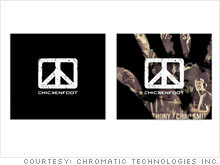 Chickenfoot -- a rock supergroup fronted by Sammy Hagar -- signed with CTI to use its ink on the band's debut CD. Song titles and images of the band members appear on the cover when it's exposed to heat or light -- or merely touched. "The band is just loving it," says Todd Gallopo, who designed the cover and owns Los Angeles design firm Meat and Potatoes. "Specialty packaging is where it's at" -- especially in an industry with slipping CD sales. CTI also produces inks that glow in the dark, change color in the sun or transform when tilted in the light. For a recent sweepstakes, Dairy Queen used CTI's ink on its Blizzard cups; when placed in sunlight the cups revealed whether they were winners. More recently CTI signed deals with Hite beer in Korea, Carlsberg beer in Hong Kong, Skol beer in Brazil and Pizza Hut in New Zealand and Mexico. This year's mission: Expand international operations to 50% of the company's business by tackling customers in India, Japan, Malaysia and Russia. Small says his six-person sales staff has been able to close deals with foreign brewers in six months -- half the time it takes in the U.S. The MillerCoors deal seems to have opened a lot of doors, and the color-changing sunlight is shining in.